It feels like just yesterday we were gearing up for the first day of school. Now here we are almost at the 100th day! It seems like it flies by faster and faster each year. Today we have 6 free 100 days of school SVG designs to share with you. Can’t find exactly one you love? 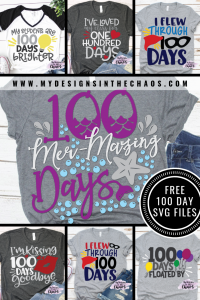 Check out more great 100 day of school designs here. These files are 100% free for personal or commercial use up to 200 uses and only if you are making the item in house. We don’t allow any print on demand (Printful, Amazon Merch Red Bubble, etc.) or distribution of the digital file itself. If you know someone who would love this file please feel free to send them the link so they can download it for themselves. PLEASE NOTE: THERE ARE AFFILIATE LINKS IN THIS POST WHICH MEANS THAT AT NO EXTRA COST TO YOU WE EARN A SMALL COMMISSION WHEN YOU SHOP THROUGH THOSE LINKS. OK, now let’s dig into the fun designs! This 100 day design is great for a boy, girl, or even a teacher. It reminds me of the movie UP. Make sure to use heat transfer vinyl if you are putting the design on a shirt. 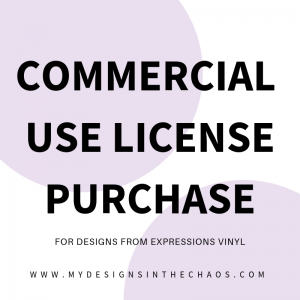 Check out all the various types of vinyl and when to use what over on this post here. I can already envision how cute the balloons would be in glitter! Sometimes schools want you to have 100 of an item on a shirt and that would be adorable with this design. Just take the balloons and in your design software copy and paste to add more. You could even add actual balloons to give it a 3-D effect! It’s also fun to add your own touches to the shirt. Put the school name or grade level on the bottom or even add initials on the balloons. This would also be a great design to use some patterned Heat Transfer. It would really give those balloons some depth. Most importantly have fun! Sometimes when designing I just can’t decide on one layout. This was one of those times so I went ahead and included both in the downloadable folder at the bottom of the post. Which one of the two designs is your favorite? This design has several colors of heat transfer vinyl and at first that can feel a little intimidating. We have shared a simple way to make 100% certain that everything is lined up perfectly here and centered on your shirt here. If your little one is more into sports we have this baseball version and basketball version too! They are both super popular! Since Valentine’s Day and 100 days of school are usually pretty close in season it is only appropriate to give it a great big kiss! This design is another one that would look awesome with glitter HTV or even flocked! Make sure though if you are using the flocked to peel once it is cool. I found this out when I was doing a FB live making these adorable socks. Now I will never forget it! I can see like the balloons adding in 100 of those little lips all over the shirt! You could do all different shades of pink HTV and read to break it up a little bit. Just open the SVG in your design program and select a set of the lips. (you might need to un-group the design first) Once the lips are selected you can copy and paste as many times as you need. Teachers need a cute 100 day school shirt too right?! This one has a matching design for a student to wear too! Check out the student version here. 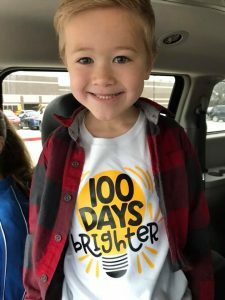 My son designed the student version (all the way down to the fonts) and he wore it for his Kindergarten 100 day celebration. I love the look of these on raglan shirts. They really help to make the words pop in the design! I can totally see you adding in a grade level on the heart to really make it personalized. How cute if a whole teacher team wore them?! Gosh… if you do that make sure to send in a picture or post over in our FB group because that would be adorable! I saved the best for last. My daughter is now in high school so these fun cutesy girl designs bring back super fun memories. I don’t get to see them in action as much anymore with three little boys but they are still so fun to design! This one is screaming for some metallic HTV, glitter, sparkle, and shine!! Do you know someone who needs this mer-mazing design? Send them the link to this post! So which design is your favorite? We have a little bit for everyone because going to school for 100 days deserves a celebration! We love being able to provide you with high quality free designs. While we don’t expect anything in return we would absolutely love it if you would take a minute and pin a few images from this post before you download. It helps us to sustain and grow quality free content. Thank You! Thanks for being here and have a wonderful 100th day of school. We love being able to serve you and until next time happy crafting, cutting, and chaos! Hello! If you click on the link of the specific file (that is in purple) it will directly download to your computer as a zip file. If you are on your phone or tablet you will need to have a chrome extension and/or an unzipping app to access the SVG file. Thanks! I decided at 10pm that I needed a shirt for tomorrow! The hundred days brighter shirt was perfect and I got it cut and pressed in under 30 minutes! Thanks for the great design. Yay! I’m so glad! 🙂 We would love to see a pic over in our FB group!